What has the Twitterati been up to? We love Twitter spats. There, we confessed. And we know you do too. This week, there was a little bit of everything and boy, has it been entertaining as hell. Continuing with the AIB debacle, Mahesh Bhatt had this to say – If being part of 4000 people in the audience and laughing is a crime, then why have the other attendees not been named in the FIR. Sonakshi Sinha, who is the daughter of person (Shatrughan Sinha, BJP MP) who is part of the present dispensation was also in the audience, why was she not named in the FIR? Certain forces are orchestrating this series of events. You have to be naive not to see that. – Want to know why we think it’s funny? Here’s why. Dear Media (Specially International Business times) HOW MANY TIMES DO I HAVE 2 SAY THAT I HAVE NEVER DATED OR INTENDED TO DATE YUVRAJ SINGH? – Here’s a tip Preity, if you don’t want it to be news then do not put it up on your twitter account in caps. Twitter and its love for outrage. So lame, so fake, so stupid, so gutless and so hypocritical. – Author bashes Twitter on Twitter. 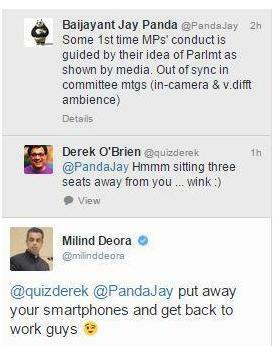 – This was a hilarious response to the ongoing conversation in Parliament on twitter between Bijayant Jay Panda and Derek O’Brien.